I know it's been too long since I blogged because in my last post I was so grateful for air conditioning! It's below freezing today (and for the next week) and the country is in a deep freeze right now. Even though I haven't been spending much time here lately (despite good intentions), I have been spending a lot of time in my sewing room (aka my happy place). I have lots to share and hope to be better about it next year. 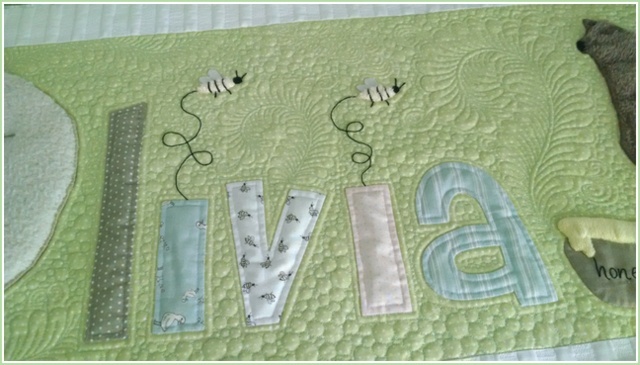 One special quilt that I did finish this year was for my first great grandchild, Olivia. 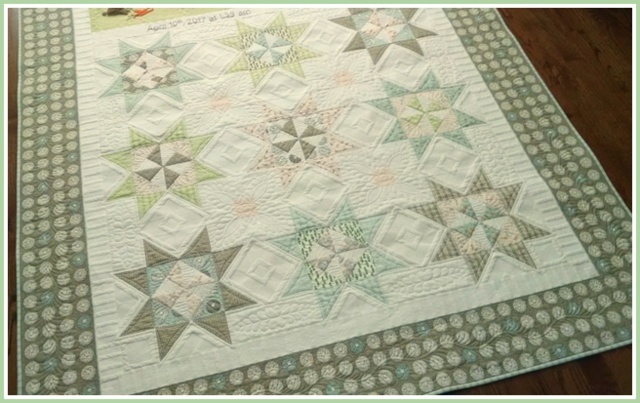 I spent a lot of time designing, picking out fabric, making and quilting this one. A lot of times I'll take patterns and make some changes to suit my tastes, but I don't often design my own from scratch. It's a little scary to see if it will turn out like you have it pictured in your head. This one did and I'm very happy with the end result. I'm calling it Olivia's Star. I used Darling Little Dickens by Lydia Nelson for most of the fabric. I then took the animal designs in the fabric and made them out of faux fur. 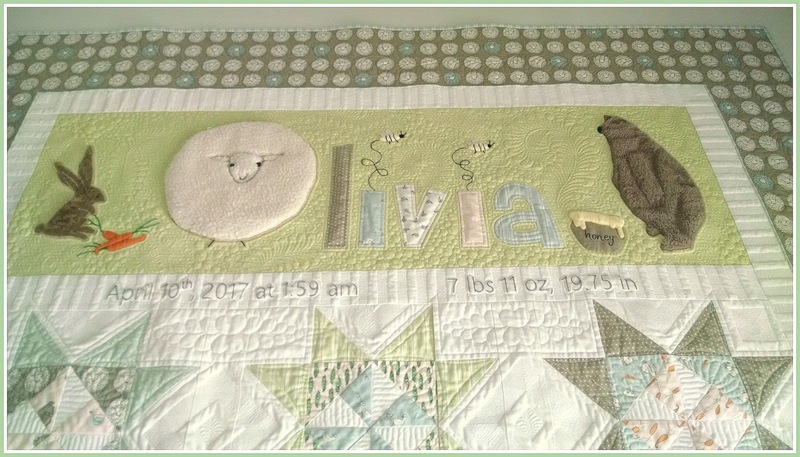 The 'O' in Olivia is the sheep. 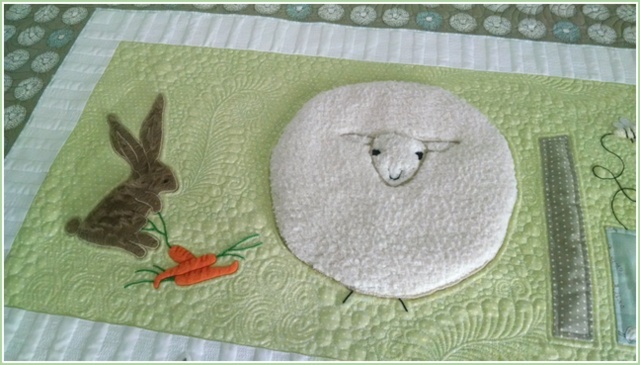 The border fabric is also made entirely of rows of sheep! I used the bumblebees to dot the 'i's in her name. 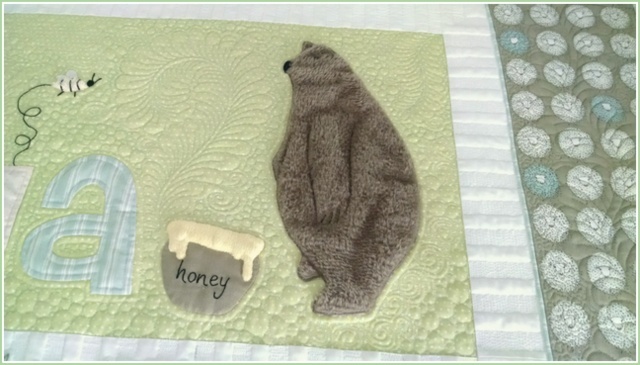 I also added a bear and his honey pot. And I hand embroidered her birth information underneath her name. 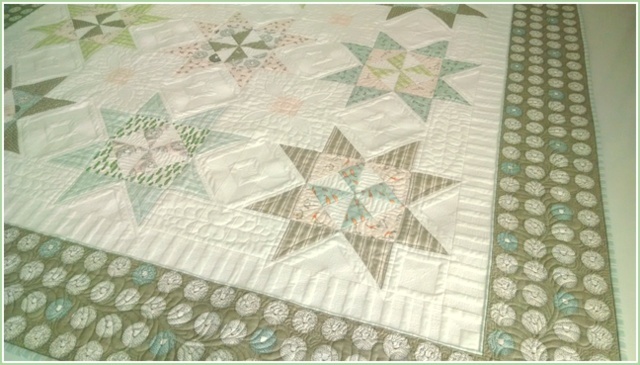 There was a lot of piecing, hand applique, hand embroidery, machine applique and free motion quilting. I even added some piping between the inner and outer borders. 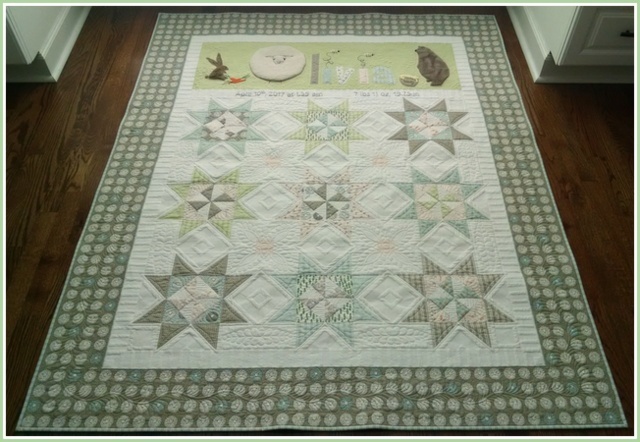 Initially I planned for this quilt to be one that Olivia could just roll around on and get dirty. I was even going to put Minkee on the back to make it soft and snuggly. But truthfully, it's more of a quilt for her to grow up with and keep. 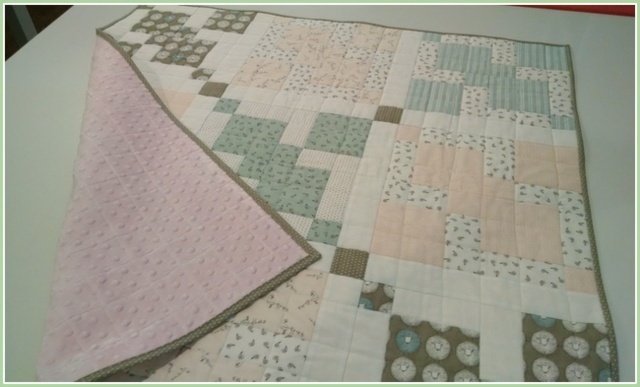 I still wanted her to have a 'binkie' though, so I made her another quilt. It's 40" square, also uses the Little Darling Dickens fabric (I have SO much of this fabric), has Minkee on the back and uses the Disappearing 9-Patch pattern. 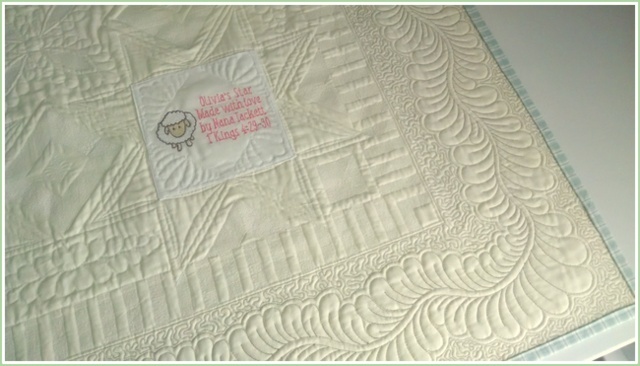 Her mom says that she uses this quilt ALL the time which makes me smile.